Like with many other sports, having the right equipment is an important consideration in golf. What’s more important to a golfer than his trusty golf club? While your game can depend on many factors like personal skills, the right club can make all the difference between winning or losing. Today, we will be reviewing one of the most popular golf clubs that you can buy in the market: the Taylormade M2 Driver. Both Tiger Woods and Rory McIlroy have been using this club, so it’s got to be good, right? In this Taylormade M2 Driver review, we’ll find out if this particular club is worth all the hype, and your money course. Let’s get to it. The Taylormade M2 has definitely made some big waves in 2016, especially when it was used by Justin Rose for securing the Olympic Gold Medal. With the M2 being such a solid club already, TaylorMade can only step up its game. 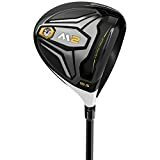 Well, it looks like they’ve succeeded because the 2017 M2 driver is shaping up to be a worthy upgrade to the M2 line. When it comes to the looks, TaylorMade went with the “don’t fix if it ain’t broke” approach. The black and white crowns of the 2016 model have received positive feedback from customers. If you were gushing over the carbon crown of 2016, then you’ll admire the 2017 all the same. There are a number of differences like the slightly smaller white strip which gives the carbon crown a more dominating look. The profile of the crown is also marginally larger. However, these changes are very subtle and will mostly go unnoticed. The most significant change in the M2 driver’s appearance is the sole. It now features a circular silver weight and looks more engineered. In addition, the traces of gold are now gone in favor of neon yellow-green color. The TaylorMade M drivers are known for their adjustability. In terms of feel, TaylorMade has done a good job in this department for the 2017 M2. The company has rolled out two drivers with their own distinctive sound and feel, this allows a good deal of customization. The 2017 M2 is a higher-pitched driver, with a more hollow, explosive feel. The M2 has a firmer feel in its face. This driver is also pretty responsive but can still hit with good power. The M2 gives off a more prominent sound. We’ve not heard that familiar driving range cannon sound but the M2 does give off that nice pop. TaylorMade has used acoustical engineering to make a stiffer sound and make it easier to manage the vibrations. Simplicity is one of the strengths of the M2, making it a popular choice for many golfers. The M2 features a Loft Sleeve with 12 settings for adjustability. Most players don’t really want to tinker with the settings too much, so the simplicity of the M2 is much appreciated. With just a few tweaks, it’s easy to get optimal results with the M2. As far as performance goes, the M2 has helped me gain about 5 yards and a few extra mph in terms of ball speed. If you have already used the 2016 M2 or the 2017 M1, then you will not be getting mind-blowing improvements with the 2017 M2. Another thing that I love with the 2017 M2 is its supreme forgiveness which means a slower swing can still produce power. Both casual players and pros will surely appreciate the M2’s driver forgiveness. Overall, the 2017 M2 driver delivers in terms of performance. That is to be expected when not much has changed since the previous year’s model. Though it looks like the M2 is a very simple driver, a lot of engineering has gone into its development. When it comes to performance, the 2017 M2 is very similar to the 2017 M1. They do differ in sound and feel. The 2017 M2 also has no adjustable weight system on the sole. The hard, hollow feel can be a deal-breaker for some players as this may result in lost shots to the right. Players with mid to high handicapper swings will also have issues with the M2. However, you really can’t argue with results. The Taylormade M2 Driver is a straightforward driver with a number of welcome improvements. The original M2 is already one of the best-performing drivers available, which is why it’s sold like hotcakes. The 2017 M2 has a pretty good launch power and can deliver good ball speeds. However, the main selling point of this driver is definitely the high forgiveness. TaylorMade has definitely done it again with the 2017 M2. What do you think of our Taylormade M2 Driver review? Have you used this driver before? Let us know your experience in the comments! For more golf information and equipment reviews, check out AtTheTee.com.